Solo private practice neurologist in Wasilla, Alaska. He started the Alaska Brain Center in 2004. Dr. Sponsler currently is a solo private practice neurologist in Wasilla, Alaska. He sees patients with disorders such as epilepsy, neuromuscular disorders, neuropathy, stroke, headaches and migraine, multiple sclerosis, Parkinson disease, myasthenia gravis, spinal cord disorders, dysequilibrium, balance, dizziness, and carpal tunnel syndrome. Dr. Sponsler has admitting and consulting privileges at Matsu Regional Medical Center (MSRMC) in Palmer. He manages a two bed epilepsy monitoring unit (EMU) at MSRMC with full time EEG technician monitoring. The EMU has been operating since September 2007. The monitoring system includes continuous video monitoring with continuous electroencephalogram (EEG) monitoring. Dr. Sponsler enjoys backpacking, running, exploring Alaska and Shotokan Karate. He also knows 10 computer programming languages and plays 5 musical instruments. He plays piano and saxophone in the worship band of Wasilla Community Church and is an instructor of Shotokan Karate at Alaska Music and Arts. Dr. Sponsler has a diverse background that makes him a uniquely qualified neurologist. Completed Chief Resident, Neurology, WVU Dept. of Neurology, 2002-2003. (Epilepsy, Neuromuscular Disorders) Neurology Board Part I Written (November 2003): Passed. 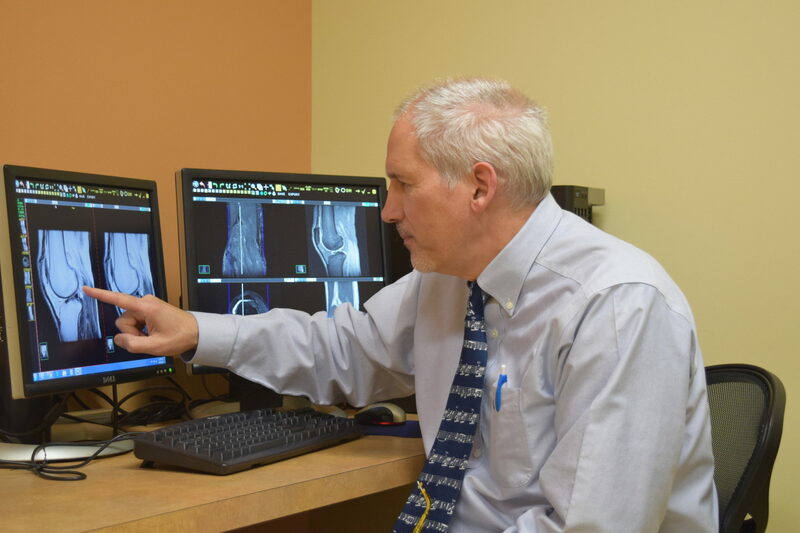 Dr. Sponsler began a career in software engineering, but in 1999 he pursued a medical career. By 2004 he opened the Alaska Brain Center and is passionate about helping people with neurological disorders. 1984-1986 Smart Systems Technology (McClean VA) – Software Engineer specializing in artificial intelligence (AI) Lab instructor for course in AI, Manager of small computer support group, co-investigator on project called ACTT (automated scheduling of satellite surveillance of ground based objects); prototype that lead to $250,000 follow-up contract. 1986-1987 Lister Hill Center for Biomedical Communications (Bethesda MD) – Software Engineer – software development, natural language processing, instructed associates via lecture series in the language Lisp, designed and taught courses in language Lisp, software developer on a software development project to analyze scientific abstracts submitted to National Library of Medicine. 1987-1995 Space Telescope Science Institute (Baltimore MD) – Software Engineer SPIKE: Technical manager and software developer on SPIKE, an automated scheduling system for the Hubble Space Telescope. This system continues to be used at the Institute. Instructor for series of classes in language Lisp Principle, software developer for the graphical user interface for SPIKE system. Principle software developer of “orientation” telescope constraint, principle software developer of “stray light” telescope constraint, principle software developer of the Criterion Autoscheduler for Long Range Planning (CASL), an expert system to create long range schedules with immediate input by astronomers, software developer on large team that developed portable proposal editing software for the Hubble Space Telescope. Proposal Submission Version 2 (RPS2) is in daily use by astronomers world-wide and at the Institute. 1996-1998 Concurrent Engineering Research Center (WVU) – Research Assistant. 1999-2000 PGY1 Resident in Internal Medicine. 2000-2003 Resident in WVU Department of Neurology. 2003-2004 Clinical Neurophysiology Fellowship (Epilepsy and Neuromuscular Disorders) at Case Western Reserve University (Cleveland Ohio). Dr. Sponsler has written many articles on neurology. His expertise is widely recognized in the neurology field. Jeffrey L. Sponsler, MD, MS Certificates of Presentation at the IASTED Conference on Intelligent Systems and Control Calgary, Canada, July 16-17, 2018. Jeffrey L. Sponsler, MD MS, Jessica C. Burkhart, BS, 2016. PlexusDX: An expert system with three dimensional localization modelling for the brachial plexus. Jeffrey L. Sponsler, MD MS, Jessica C. Burkhart, BS, 2016. AphasiaDX: An expert diagnostic system for aphasia. ISAR 2016 Presentation Certificates for PlexusDX and AphasiaDX. (Zurich, Switzerland). Jeffrey L. Sponsler, MD, MS Certificates of Presentation at the 24th IASTED Conference on Modeling and Simulation Banff, Canada, July 17-19, 2013. Jeffrey L. Sponsler, MD, MS PLEXBASE: A digital model of the brachial plexus Proceedings of the 24th IASTED Conference on Modeling and Simulation Banff, Canada, July 17-19, 2013. Jeffrey L. Sponsler, MD, MS StrokeDx: A stroke diagnosis program. Proceedings of the 24th IASTED Conference on Modeling and Simulation, Banff, Canada, July 17-19, 2013. Jeffrey L. Sponsler, MD, MS NEUROBRIDGE: An AI development environment for neurology. Proceedings of the 24th IASTED Conference on Modeling and Simulation, Banff, Canada, July 17-19, 2013. Jeffrey L. Sponsler, MD, MS Fei Pan, MS An Electronic Medical Record for Neurology. Proceedings of the IASTED Conference for Telehealth, Innsbruck Austria, February 2012. Jeffrey L. Sponsler, MD, MS Automated Analysis of Electromyography Data. Proceedings of the IASTED Conference for Telehealth, Innsbruck Austria, February 2012. J Sponsler, MD, M Senta, A Kendrick-Adey Stroke expert system extended to diagnosis CADASIL. Proceedings of the IASTED Conference for Telehealth, Innsbruck Austria, February 2012. Jeffrey L. Sponsler, MD, MS StrokeDX: A logic programming system to diagnose stroke. Proceedings of the IASTED Conference for Telehealth, Innsbruck Austria, February 2012. Sponsler JL, Kendrick-Adey AC. 2011. Seizure as a manifestation of Multiple Sclerosis: A case report and literature review. Epileptic Disorders vol 13, no 4, pp 401-410. Sponsler, JL, MA Werz, R Maciunas, M Cohen, 2005. Sarcoid presenting with simple partial seizures and an enhancing mesial temporal mass: A case report and review of the literature. Journal of Epilepsy and Behavior, June 2005. Sponsler, Jeffrey, MA Werz, M Kahriman, 2004. Video EEG Expert System: Software to compute seizure focus lateralization and localization prior to epilepsy surgery. Proceedings of the IASTED International Conference on Modelling, Simulation and Optimization (MSO2004), August 17 -19, 2004, in Kauai, Hawaii. Sponsler, Jeffrey L, Frances VanScoy, James Culberson, 2004. The System for Neurological Analysis of Patient Symptoms: An Integrated Artificial Intelligence Prototype. Proceedings of the IASTED International Conference on Modelling, Simulation and Optimization (MSO2004), August 17 -19, 2004, in Kauai, Hawaii. Sponsler, Jeffrey L, Mary Ann Werz, Mustafa Kahriman, 2004. Abstract. Video EEG Expert System: Software to compute seizure focus lateralization and localization prior to epilepsy surgery. Proceedings of the American Epilepsy Society 58th Annual Meeting, Dec 3-7, 2004 (New Orleans, LA). Sponsler, Jeffrey, Frances Van Scoy, Doru Pacurari, 2002. An object oriented neuroanatomic atlas, Proceedings of the Conference of Artificial Intelligence and Soft Computing, Banf Canada, July 2002. Received Best Paper Award. Sponsler, Jeffrey L. 2001. HPARSER: Extracting formal patient data from free text history and physical reports using natural language processing software. Proceedings of the American Medical Informatics Association Annual Symposium, Washington DC, Nov 3-11, 2001. Sponsler, Jeffrey L., 1994. A Criterion Autoscheduler for Long Range Planning, Proceedings of the 1994 Goddard Conference on Space Applications of Artificial Intelligence (Greenbelt, Md). Sponsler, Jeffrey L., Mark Johnston, Glenn Miller, Anthony Krueger, Michael Lucks, Mark Giuliano, 1991. An AI Scheduling Environment for the Hubble Space Telescope, Proceedings of the Computing in Aerospace 8 October 21-24, 1991 (Baltimore MD), pp. 14-24. Sponsler, Johnston, Miller, Krueger, Lucks, Giuliano, 1991. An AI scheduling environment for the Hubble Space Telescope vol 5, no 3 (Pergamon Press, 1988), pp 197-212. Sponsler, Jeffrey L., 1989. Genetic Algorithms Applied to the Scheduling of the Hubble Space Telescope. Proceedings of the 1989 Goddard Conference on Space Applications of Artificial Intelligence (May 16, 1989). Sponsler, Jeffrey., 1988. Lisp Object State Saver: A facility used to save partial schedules of the Hubble Space Telescope. 1988 Goddard Conference on Space Applications of Artificial Intelligence(May14, 1988), pp. 425-435. Miller, Johnston, Vick, Sponsler, Lindenmayer, 1988. Knowledge based tools for Hubble Space Telescope planning and scheduling: constraints and strategies. Telematics and Informaticsvol 5, no 3 (Pergamon Press, 1988), pp 197-212. Sponsler, M Johnston 1990 An approach to rescheduling activities based on determination of priority and disruptivity. Telematics and Informatics, 7, pp 243-253 (Pergamon Press). Vick, Shon, and Jeffrey L. Sponsler, 1990. Tools and Techniques for the development of Common Lisp applications across heterogeneous machines. Proceedings of the First IEEE International Conference on Systems Integration (April 23,1990), Morristown, N.J. (New Jersey Institute of Technology). Johnston, Mark, Glenn Miller, Jeff Sponsler, Shon Vick, 1990. Spike: Artificial intelligence scheduling for Hubble Space Telescope. Proceedings of Fifth Conference on Artificial Intelligence for Space Applications (Huntsville, May22, 1990), pp 11-18. Alexa T. McCray, Jeffrey L. Sponsler, Brandon Brylawski, and. Allen C. Browne. The Role of Lexical Knowledge in Biomedical Text Understanding. Proceedings of the Annual Symposium Computer Applications in Medical Care. 1987 November 4; 103-107. Suite for Dolly Sods: A collection of original jazz-rock compositions. CD was released in 1999. Stage performances of original musical play ETHERIA, Baltimore 1992 and 1993, Morgantown, WV 1996.